I would like to thank fellow collectors for their time and energy putting together the wonderful patterns. 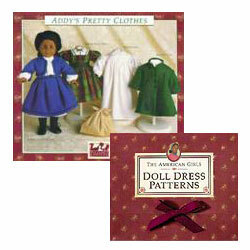 Years ago American Girl Provided patterns for many of the historical characters. Those patterns included the Pajama's and usually two other items along with accessory pieces. 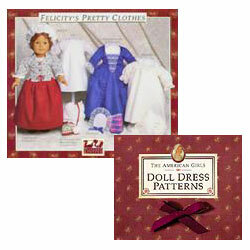 The patterns were pretty basic but not always as easy to follow like newer patterns available for dolls from sewing stores. 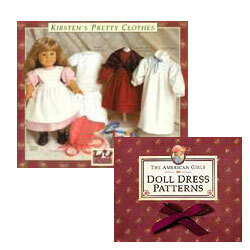 However, they were fun to look through and could provide your doll with some of those pieces to her wardrobe that American Girl no longer carries. 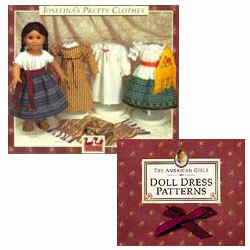 Clicking on any of the images will take you to your dolls direct downloadable pattern in a Zip file PDF. Understand that each download may take quite a bit of time depending on your transfer speeds. Each files size is noted. All PDF files should be printed at 100% , no scaling, with margins 0.05 or less. Some pattern pieces are scanned in twice, and will need to be carefully lined up and taped to make a complete pattern piece. Adobe Reader is required to view the PDF files. If you do not already have it, you can download it here. Enjoy this treat from fellow collectors at AGPlaythings!